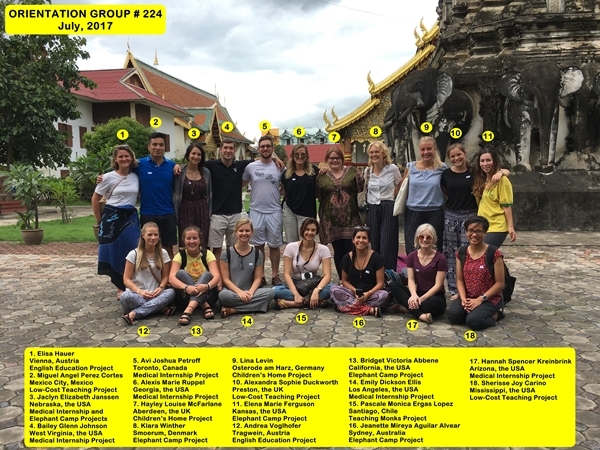 Presenting Chiang Mai Volunteer and Intern Group #224! This group arrived a few weeks ago, and started their projects in mid-July. A great group of 18 volunteers and interns from Austria, Mexico, Canada, the USA, the UK, Germany, Chile, and Australia. A diverse group indeed! While their time here, the participants in this group are taking part in our Medical Internship, English Education, Low-Cost/Rural Schools, Elephant Camp, and Teaching Monks Volunteer Projects. For more info on our different volunteer and intern project opportunities, please visit our projects page.